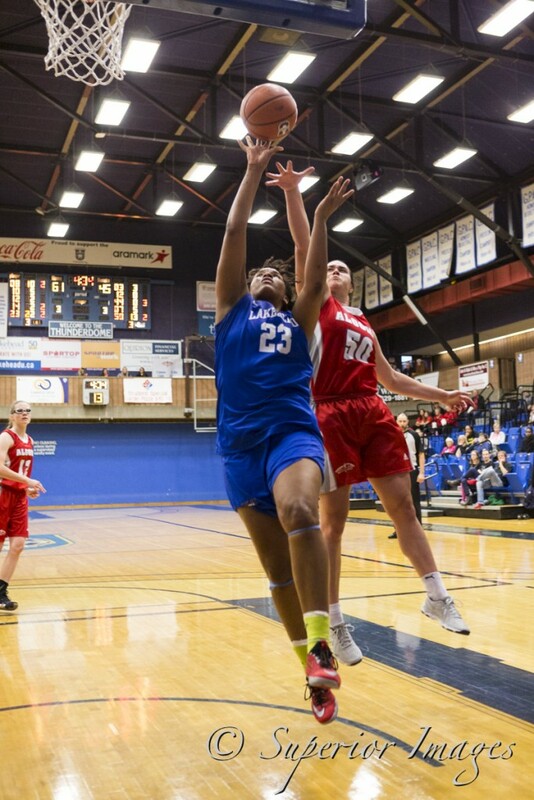 The Lakehead women’s basketball team won their first game of the 2018/19 season, 93-66, over the Algoma Thunderbirds during non-conference play for Homecoming weekend. “Sloppy first game at times from both sides but overall both sides scored a lot of points. I’m not too sure that we saw much defense out there so I am sure both teams will look to tune that up. Leashja looked great tonight and I was pleased with how our first-year point guard, Sofia Lluch, played tonight,” said Coach Jon Kreiner after the game. The Thunderwolves went on a 15-3 run late in the first quarter that gave them a comfortable 23-15 lead after the first ten minutes. Lakehead continued to push in the second, outscoring the Thunderbirds 29-16 to lead at the half 52-31. Algoma put up a fight in the third and kept pace with the Thunderwolves in a back and forth game outscoring them 21-20. The Wolves picked up their game in the fourth and, thanks to their big first half, they carried on to win the game 93-66. The Wolves were 50% from the three tonight going 11-22 and were only 48% from the free throw line compared to Algoma’s 76%. The reigning OUA MVP, Leashja Grant, dominated all players with 34 points, 10 rebounds, and 4 steals. Her teammate and first-year T-Wolf Sofia Lluch debuted with 11 points and 5 assists along with Tiffany Reynolds and Nikki Ylagan who each respectively put up 11 and 10 points. The ‘Wolves are back in action again tomorrow against the Thunderbirds at 6PM in the Thunderdome for another non-conference game.